HJ: A wise mentor once said, the present moment is your point of power. Anything you want to do, be or create originates within the present moment. So get there, be there and thrive. I’ve written many articles telling people to live in the present and articles about my own adventures on how to live in the present , but I’ve never truly explain why it’s necessary and how to go about doing it. The way I see it is that it’s like a muscle, a skill that you must develop and strengthen where it gets easier with time. After a lifetime of conditioned thought patterns, we come to believe that thoughts are all there is to us. Rather than the quote, “I think, there fore I am”, I think it is more accurate to say “I am, therefore I think”. We believe that we are our thoughts. I lived this way for many years, most of my life actually. Even after coming to the realization that living in the moment is crucial to my wellbeing, I continued to listen to my thoughts and live in them. Even today, driving to University I had many relapses of living in my thoughts, and coming to believe them as who I am. The distinction that we must come to realize is that we have thoughts, and we always will, and that’s okay. But once we let thoughts become the master, rather than becoming the master of these thoughts then we will suffer. That’s only just one aspect of how our thoughts can take the beauty and true essence out of the moment you are in now, and make you live in the past whilst also bringing worry to the future. Personally I’ve developed my intense presence awareness muscle so much that it is a lot easier for me to slip back into the now, as before it used to take me forever of battling with my own thoughts and trying to silence them. It was a struggle, and I understand that many of you who are reading this now struggle with it as well. But rather than fight it, we have to simply create space between it. A key point to understand is when we are present it’s not so much that we won’t have thoughts; it’s more that these thoughts don’t become identified to who we are, and simply become just background noise or static. Thoughts are just a function of the human brain, and doesn’t reflect your true state of living. If your thoughts are saying you’re an idiot for losing that argument, just don’t listen to it; don’t attach it to who you are to it. See it as simply background noise. In some situations you may not know a lot, and in other situations you may be an expert. 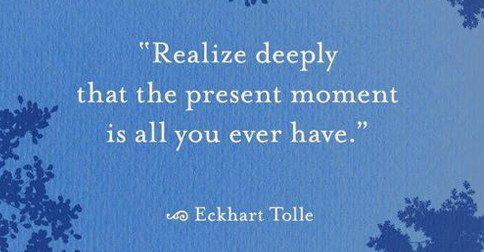 It doesn’t matter, and you lose the essence of the present moment. You’re thoughts are just thoughts, and don’t reflect your who you really are. Before I start teaching the many methods of how to live in the present, I will explain why it’s so crucial and necessary to do so. Why Return To The Now? The first point to why it is so crucial is that it cultivates aliveness in your being where life just becomes joyful for no reason. A sense of joy arises where you don’t know where it’s from, but it’s there. I believe this is because happiness is our normal state; we are born with this joy, those blissful states. So throughout life we grow up conditioned with reasons why we can’t be happy, where commercials tell us we need to buy this, and society tells us we need to get a good job or we won’t be happy. All this does is skew our perceptions of reality. To get back into the present moment means to completely dis-identify with these thoughts of self-sabotage. Once we no longer identify with our thoughts, we start to feel good, and feeling good only spreads goodness into the world. We are happier, we don’t cause suffering, and we generally make the world a better place. In the current state of the world where fear is so present in the awareness of many, feeling good is something that will bring back balance to our lives and the lives of many around us. As the Buddha said, happiness is like the light of a candle, where spreading it won’t make the candle light any less dimmer. Another crucial point is that it brings a higher quality to what we do. When people do what they love, when they are so passionate about something and they do it — it automatically forces them into the present moment. Think about the last time you did something where time seemed to just completely disappear, whether it was playing a game, reading or watching a movie. You were so present that it caused time to simply not exist in your awareness, as you just simply forgot about everything else around you. I believe that this kind of presence will improve anything you do. If you currently work in the office, be there totally, when writing a book, be there completely, because if your thoughts are taking over you won’t put all your focus and attention on your work. The most successful people in the world are so successful because they do what they love, and in doing what they love they bring a presence to their work and they produce things of high quality. The third and very important point is to simply end the personal suffering which is caused by thought. The ego predominantly stems from our thoughts, which is never present but always in the past or in the future. That’s not a good way to live because the future is always never as you imagine it to be and the past you can’t do anything about. Change is constantly happening. If you’re always living in the past then you miss the essence of this change and you can even deny the change to happen. Let’s say someone has hurt you in the past, and you see them as that person who will hurt you again, you don’t allow them to change by the way you interact with them. There are many ways of cultivating your awareness muscle as I like to call it. Awareness is what will determine your level of presence, as you can put your awareness either on your thoughts, or on your being. We are human beings after all, not human doings or human thinkings. To return to the present moment is to simply put your awareness on your surroundings, on your body or on your breath. There are many techniques and many different ideas of living in the moment, but the main essence of it all is to simply disengage thought, to create a gap between the thoughts and the present moment. Here I want to give you a list of techniques which I’ve personally used to cultivate my awareness muscle, and to allow myself to be more aware of the present moment and to create some distance between who I am and what my thoughts are saying. 1. Become aware of your Breathing. This is one of the most common ways people are taught on how to return to the now. We are breathing, always, even if we focus on it or not. Let me digress for a second however and give an analogy between our thought and our breathing, since we are on the topic. Our breathing is something that happens to us, and it is something that we can also make happen. It goes on naturally, even if we don’t focus on it. This can be applied to thoughts as well, because thinking is something that will happen naturally, whether or not we make it happen, and in the same way we can also choose to think. So don’t be so concern about what your thoughts are thinking, they are just a happening. Now you may see how thoughts can be compared to just noise and static. So back to this method, a good technique is to feel fully the sensations of our breath going into our nose or mouth. What I try to do, to take our awareness further from thought is to breath in both through our mouths and nose at the same time, and be aware of it fully. Do this for 10 or 20 breaths, and you’ll start to feel some distance between your awareness and your thoughts. 2. Mindful eating. Most of us when we eat we’re doing something else, we’re thinking about something else and forget about the food going into our mouths. Whenever I’m eating I like to make it a mindful practice, and it is an easy way to take our awareness from the static of thought. When you take a bite, taste the food fully. What does it taste like? What are the sensations on your mouth? How does it smell? There are so many things to put our awareness on, that’s why mindful eating is such a great practice for your awareness muscle. Even if you’re drinking a beer, or a glass of wine, smell it, taste it fully. Many times you will find that this is a good way of eliminating all the things which are bad for our body. When we’re eating those French fries, and we bring our awareness to it fully, we truly taste what it’s like. It may be very oily, make us feel sick, and we will naturally not want to eat it. 3. Walking meditation. This is something easy and accessible at all times – especially if you do a lot of walking or moving about in your day. Popularized by Buddhist monk Thich Nhat Hanh, it is to put all your awareness on every step that you take. Begin by standing still, and just being aware of your weight on your legs, the sensations of how this feels like, both on your thighs, your calf and your foot. When you take your first step, be aware of your feet hitting the ground, with the sole of your foot landing first followed by the rest of the feet. This is a great practice to strengthen your awareness muscle even when your at work, at university or just walking around the home. For a more detailed explanation, check out this article. 4. Mindful showering. Rather than trying to think about your issues, or trying to solve the world’s problems, a good way to practice being in the present is when you take showers. Showers are something you do every day, and it’s another place for you to return back in the now. A shower is full of sensations for your sense perceptions and a good place to take your awareness off your thoughts. A good place to start is as soon as you take your clothes off, feel the sensations of the air on your bare skin. Once you turn on the shower, put your focus on the sensations of the water hitting your body, what it feels like, where the water droplets land. What I like to do is to feel the sensations of each individual part of my body, starting from my toes, through my legs, up to my body and then onto my head. Then you can focus on the sound of the shower, the feelings of the steam hitting your face, and whatever way you can think off. Remember, the important thing is that you’re creating distance between your awareness and your thoughts. 5. Hyper focus on the hand. Have you ever put your full attention on your limbs, especially your hands? There’s a certain aliveness about it, a slight tingling sensation you can feel. It’s as if it’s vibrating at the minuscule level. To do this you just have to go straight to the hands with your focus and just feel. At first it’s tricky, as your thoughts will come in and you’ll start mentally labelling it and your mind will become involved. You may notice yourself going: “I don’t feel anything, what am I looking for?” or whatever thought may arise. The trick is to put your awareness on your hands, feel the aliveness of your fingers, your palms, and it’s interaction with the air around it. Go straight to your hands with your awareness, and feel it as fully as you can. Practice always makes perfect with this one. Some of you may have noticed why I didn’t put down sitting meditation. There’s nothing wrong with sitting meditations, and it can become very beneficial to have a daily period where your awareness is completely disengaged from the mind, and your thoughts are allowed to just be and your consciousness is allowed to just be. But what I’m trying to advocate in this article is to be in the present all the time, not just for 30 minutes a day. The truth is that you can never not be in the now, and it’s just your thoughts which make you believe otherwise. Thoughts can only truly exist in the past or in the future, and the ego also lives in the past or future. To end suffering in your life, and to fully grasp the beauty of living, we have to step out of thought and return to the moment in which is all there really is. You are always in the present moment; it’s just that you forget. Some people live their whole life either in the future or in the past, and they then wonder where their life has gone. It is always there, you just have to notice it. So I hope you now understand how to live in the present. If you have any questions at all on this, please feel free to ask as I’d be glad to help. Enjoy your present moment adventures!